Find the perfect used Mazda 6 for your lifestyle with the collection at RAC Cars. This model is the fastest selling Mazda worldwide, in the company’s history. It is an all-around family car that is available in a Saloon, Hatchback and Estate. 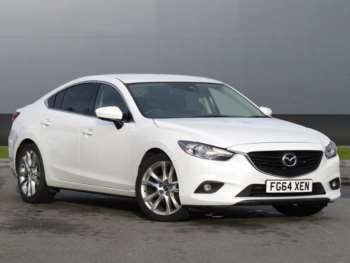 Mazda produces stylish, reliable and practical cars, so you can expect that from the used Mazda 6s for sale here. The sleek, modern cabin boasts some individual touches, such as the three-spoke steering wheel, but the whole thing has an unmistakable, Japanese neatness. Enjoy 17-inch alloy wheels and xenon headlights on the Sport version. The entry-level S comes with a generous complement of twin front, side and roof airbags, anti-locking brakes, air conditioning, electric heated door mirrors, a Thatcham category 1 alarm and 16-inch alloy wheels. If you want more, the TS gives you a CD player, trip computer, climate and cruise control and a leather-trimmed steering wheel. This model is built to be driven well and thoroughly, with sharp steering, a stable chassis and a satisfyingly smooth gearbox. The small engines are perky and the larger ones are punchy. A used Mazda 6 is a realistic contender for the best car in its class, certainly at this price range. You will struggle to find a smarter, better performing, more dynamic rival for the same money. Got a specific Mazda 6 model in mind?